“Dream big, win bigger” is the motto of Bitstarz Casino where players from all around the world can play a variety of slot machines, table and jackpot games. 3D quality games, reliable customer support, easy to navigate layout and, above all, almost instant payouts are some of the aspects for which the online bitcoin-operated casino is distinguished as one of the best in the business. Established in 2013 by a group of enthusiasts, casino players themselves, the gaming venue offers over 600 games and accepts virtual currency Bitcoin, as well as Australian dollars, British pounds, US and Canadian dollars, Euros, Norwegian kroner and Swedish kronor. Here are some of the reasons Bitstarz Casino, licensed by the government of Curacao, is considered the gold standard of online casinos. 100% up to 5BTC Play Now! The casino is powered by SoftSwiss, the platform which enables instant-play gaming on any computer, smartphone or tablet, so no download is required. NetEnt, Amatic Industries, Betsoft, Endorphina are just some of the software providers employed by the premium gaming establishment. In addition to slots, their customers can also enjoy some regular table games such as blackjack, baccarat, European and American Roulette, Texas Hold’em and more. Bitstarz Casino uses a cryptographic method that ensures that neither casino nor the player know the outcome of the game until the moment it starts, so all games are 100% fair and verifiable. With the help of Ezugi technology that powers their live casino, Bitstarz Casino offers a good selection of live dealer titles including Blackjack, Baccarat, Roulette, Texas and Casino Hold’em and many more. The real gambling atmosphere of the traditional live dealer casinos hosted by attractive female dealers is achieved thanks to the live action being streamed in real time from Costa Rica. 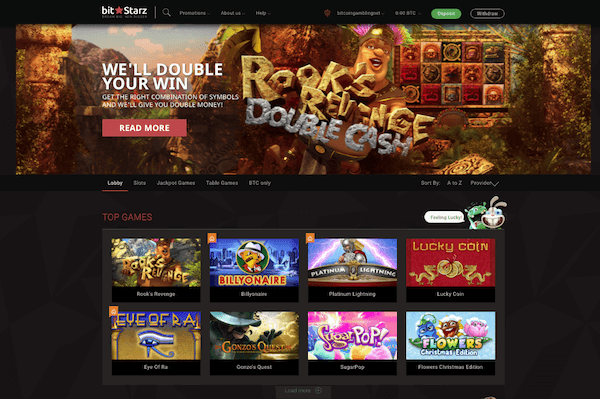 The feature also places Bitstarz among the top-ranked Bitcoin-operated casinos. While the bets for live table games are limited to 100 mBTC, which is considered to be an obstacle to big wins, the payouts for those customers playing slots are much higher. It is obvious that Bitstarz Casino focuses more attention on the latter kind of gambling. By signing up, you can get a no deposit bonus of 25 free spins. However, if you are a real money player, your first deposit brings a 100% match bonus up to €100 or 1BTC right away. Besides, the part of the welcome package is the total of 180 free spins, 20 per a day for nine days, and you can use them on specific games. To claim your welcome bonus, you should make a deposit of at least 0.05 BTC (50mBTC) or €20. By selecting the ‘Yes, please give me any deposit bonus’ box when making the deposit, the bonus is automatically transferred to your account. The same goes for the second deposit (no free spins included) while your third deposit will be rewarded with a 50% bonus up to €200 or 2 BTC. 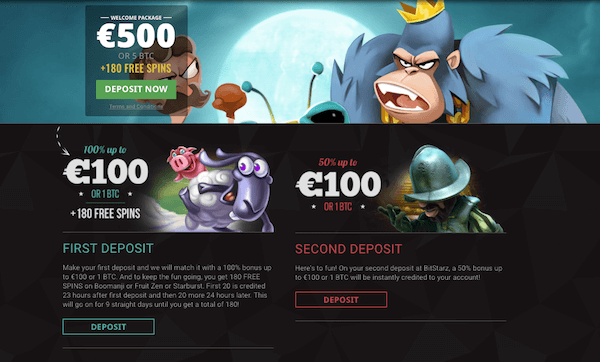 For the fourth deposit, you get another 100% bonus match up to €100 or 1 BTC. Considering that all bonuses will expire after 30 days during which they need to be wagered 40 times before the funds can be withdrawn, it is practically impossible to turn your bonuses into real money. You can play all the games on mobile devices without downloading. The good news is that you can also play the games for free and try out their features before switching to real money play. The mobile platform looks exactly the same as the desktop site. Having been optimized for mobile devices, the games lose none of the appeal when they are played on tablet and smartphone. Why Choose Bitstarz Casino vs 100 Other Brands? Get Your 5BTC Welcome Package Now - Visit BitStarz >> Play Now!